The roof has now been completed. Yaya a local carpenter worked with Matt. It looks impressive! The ceilings are almost finished, and the windows and doors have put in. The plastering will soon be done. So it is well on the way to be finished this year we hope! 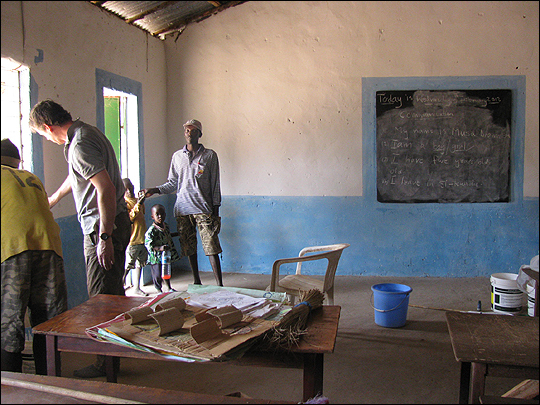 In February Matt painted the school classrooms, Modou’s white and yellow, Saine’s white and blue. Just fantastic, never looked so smart! He also has made all the desks the same height, again a vast improvement and also made them stable and did repairs where needed. The outside of the school has also been painted in white and green. A lot of use is made of the pavilion…. being used mainly for story telling, singing and dancing. Alpha is working hard to make sure that the school garden is producing well, and Tombolou our school cook does a great job in producing a meal at lunch time for the children Monday to Thursday each week. 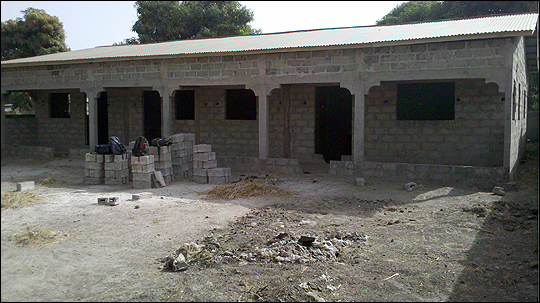 The windows have now all been installed and completed in all the classrooms needing them. The staff and pupils are so pleased with them, this has enabled the school to qualify to be open in the afternoons. The exercise books we supplied at the beginning of the school year were almost enough, but we have supplied more recently to ensure that they have enough to the end of the school year. We donated two djembes (African drums) a few years back which needed new skins to replace the old ones, this we did earlier this year. We purchased and delivered five 80 litre bins with lids for their environment project. In addition to the shipment supplies delivered, in Februray we took boxes of surgical gloves, two diabetic machines, dressings, knitted blankets, and teddy bears made by Dorothy. They asked us to give out some of the teddies to young patients on the ward; to see their little faces light up was just wonderful. They are still desperate for toilets, sadly we have been told the lack of facilities is putting staff off working there. We donated two large solatec lamps and solar panels, these have proved very useful, particularly as one night a lady was in labour on her way to the hospital, and the staff were able to take a lamp with them when they went to deliver the baby. The door has a new lock, and Seedy our new manager is keeping the library neat and tidy. Matt and Richard have re-painted the outside of the skills centre, cream and black – very smart! A window has been made in one of the storerooms to provide a lot more light and airflow. The skills centre has a new manager, a lady from the village who is very capable and doing a great job. The building is being used a lot for all sorts of programs, and has become very important to the village community. We have 34 sponsored students in total, four of those are at the Gambian Technical Training Institute. Lamin Njie is in his second year at university, and is getting excellent marks for his work.